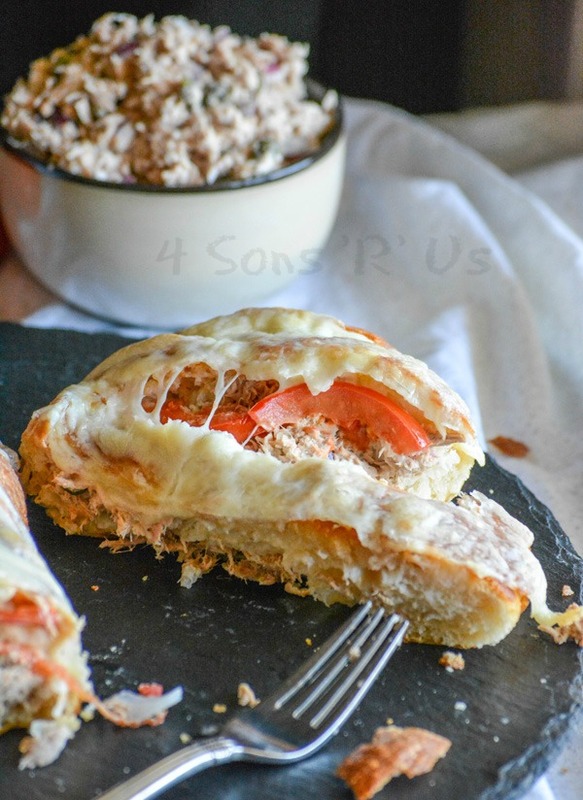 Creamy tuna salad featuring capers, red onion, and oregano and tomatoes are stuffed into a crusty baguette before being topped off with toasted provolone cheese. 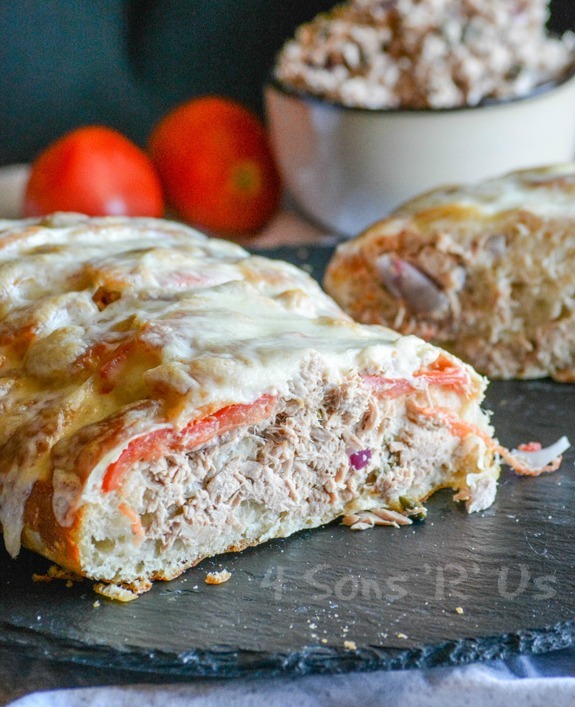 A bold spin on an old lunchtime favorite, this Pull Apart Tuna Melt Loaf was made for sharing. Anybody else’s kids live on sandwiches? Like seriously live on them? Oh, you too? Cool, because mine do. I’m fine with it for lunch. At dinnertime when I get dramatic sighs and eye rolls because they actually have to wait for the main meal? Then I get annoyed. There might have even been a time or two where my temper may have gotten the better of me. Sorry my child, but no you may not make a pb & j and call it a day. I know, I know. You have the meanest mother in the world. How dare I make you wait for the nutritious, hot meal that will be on the table, in front of you, in less than twenty minutes. There are other times though, where I roll with it. Especially when we need a light meal. Or a meal that isn’t putting off steam when it’s over 90 degrees out with added humidity. Still, if it’s going on the table for a family meal– I can promise you, it will not contain either peanut butter or any kind of jelly. It’s gotta be something hearty, and really ‘meal’ worthy. Bonus points for it being easy to serve and easy for the kids to grab and chow down on. That’s one of my biggest reasons for my love of pull apart’s. They can double as a lunch, or an appetizer for a crowd. We enjoy them for dinner too, especially paired with a salad. 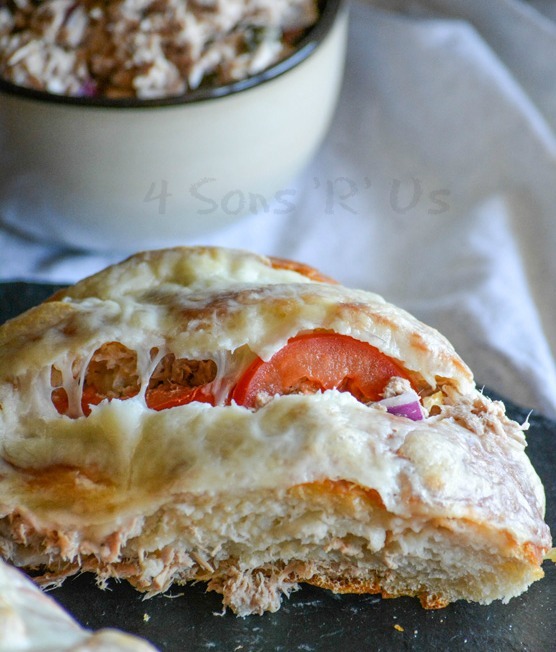 This time I decided to take one of our favorite sammies, the tuna melt, and stuff it into a hearty pull apart loaf the whole family could enjoy tearing into and plating up at lunch time. Let me tell ya bout my latest lunchtime craving, say ‘Hi’ to the lovely lunch that is the Pull Apart Tuna Melt Loaf. This gourmet sandwich features a creamy tuna salad with a tangy kick of capers and thinly sliced tomatoes stuffed into slices cut into, but not all the way through, a fresh crusty baguette. 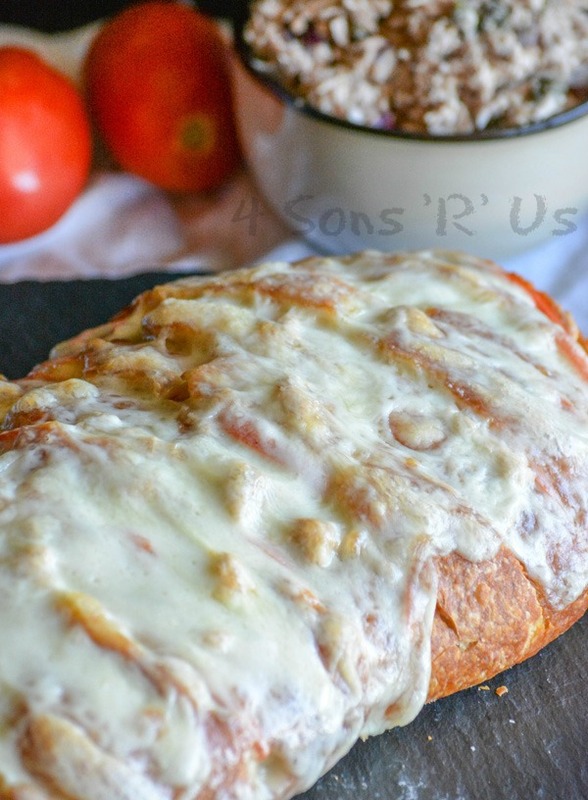 It’s topped off with thick slices of provolone cheese, melted to perfection and seeped into every nook and cranny. 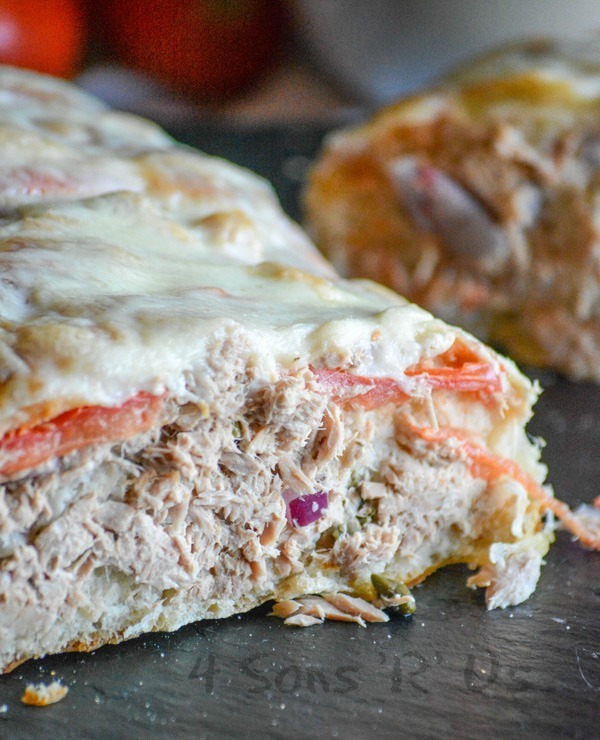 The Pull Apart Tuna Melt Loaf was made for sharing. It’s a fun way to shake things up at meal time and is sure to encourage some great conversation around the family table. 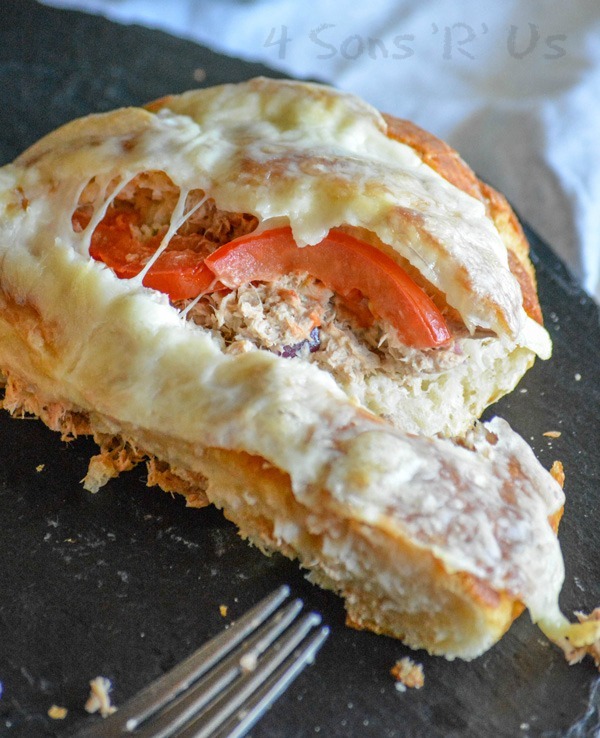 A new spin on the classic tuna melt, this pull apart version is stuffed with flavor & meant to be shared. In a medium sized mixing bowl, add all of the tuna salad ingredients and stir until evenly combined. Use a bread knife and slice the bread loaf 6-8 times, stopping before you actually cut through the bottom. You want it to stay together so it can be stuffed. Spread a bit of mayo between each slice. Stuff each slit evenly with the tuna salad so that it's full, but not splitting. Add at least one tomato slice to each tuna stuffed slit. Top the entire loaf evenly with the sliced cheese. Transfer the load to a large, rimmed baking sheet and broil for 3-4 minutes- or until the cheese is golden brown and bubbling. Transfer the stuffed pull apart loaf to a platter and serve warm. What an amazing dish to share at this week’s Fiesta Friday! I’ll be saving this one! Oh so good! What a great idea! Looks so yummy! I’m visiting from Fieta Friday.